Traxx Construction / Traxx Goes Red! 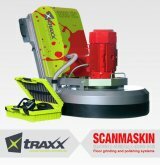 Traxx Construction Products, one of Australia’s leading brands and Scanmaskin, now Europe’s premier brand in Surface Preparation, have joined forces in Australia and New Zealand. Managing Director of Marketing and Sales for Scanmaskin, Mr. Paulo Bergstrand said “we are delighted to have the Traxx Team on board with our brand. They cover the entire region of Australia and New Zealand with experienced, talented and motivated sales professionals, supported by a first class team of sales support, repair and logistics specialists”. Traxx Managing Director, Lloyd Williams was delighted with the new arrangement. “we have worked with Scan for some time now with an own branded product, but with Scan’s fast Global growth, it makes serious sense to “go red”, given the massive brand recognition that the product is getting as a result of expansion not only in Europe, but in USA and North Asia”. “We are very excited about the future of the Scanmaskin products, knowing what is currently in the pipeline and the ambitions of the company”. Monkey Fist is saving big bucks. Traxx Catalogue 2014 Out Now! CONCRETE FX grinds "THE BLOCK SKY HIGH". Traxx release DBM32-4 speed drill motors. DustBoss DB-100 - the BIGGEST DustBoss EVER! OUR NEW VANS & TRUCKS HIT THE ROAD. TRAXX helps rebuild CentralWorld in Bangkok. CFQ. How does it work?????? New Diamond Wire Range released. New Core Drill program released. Australia's First DUST BOSS delivered.